Most posts are Reviews of soccer movies and football films. Articles that are not reviews are tagged and categorized as Notes. Generally, Notes are additional football-related research that I have done after watching certain films. Or, Notes may be compilations of reviews, such as the Best and Worst films that I’ve reviewed during the year. 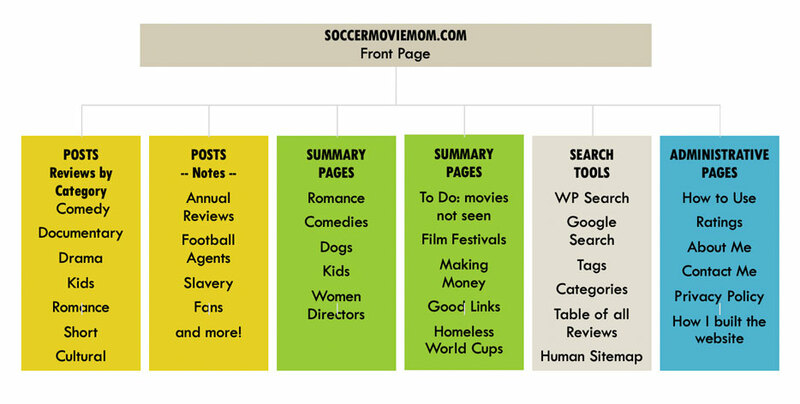 Tags are used for SoccerMovieMom ratings, country of origin, and aspects that apply to multiple films. Since WordPress doesn’t support sub-categories, I use Tags as a substitute for that. Pages are articles that summarize salient trends: soccer movies about dogs, homeless world cup, kids, women directors, how movies don’t make money, and film festivals. All the trend pages have links on the front page of the site.